The resignation of presumptive Democratic Presidential nominee Barack Obama's Muslim outreach coordinator is triggering a new wave of harrumphing that Muslim Americans are being shut out of the 2008 campaign. Mazen Asbahi resigned less than two weeks after joining the Obama campaign. It happened after the Wall Street Journal asked about his past involvement with the "Allied Assets Advisors Fund, a Delaware-registered trust. Other fund board members at the time included Jamal Said, the imam at a fundamentalist-controlled mosque in Illinois," the Journal reported. "I think that Mazen Asbahi is a victim of what I would call the anti-Muslim smear and fear campaign that we have seen in this election cycle time and time again. In this case, like many, the allegations started on a web site that did not corroborate what they are allegating (sic) with any evidence. They stated that he had certain links with fundamentalists, in this case the allegation was against imam Jamal Said, who I know personally to be a great American faith leader and not a radical imam as the Wall Street Journal falsely stated." Some of Asbahi's associations with Muslim Brotherhood groups have raised legitimate questions about whether he holds radical views. There is plenty, however, to show that Said does. Asbahi's association with Said and the fund raised legitimate issues for journalistic pursuit. Start with the fact that Allied Assets is a subsidiary of the North American Islamic Trust (NAIT), which was founded by Muslim Brotherhood members in the United States and holds title to dozens of American mosques. NAIT is an unindicted coconspirator in the terrorism financing trial against the Holy Land Foundation for Relief and Development (HLF), which ended is a mistrial in 2007, and is set for a retrial next month. It is listed eighth among "A list of our organizations and the organizations of our friends" in a 1991 US Muslim Brotherhood memorandum entitled "On the General Strategic Goal for the Group in North America." This document calls for a "grand Jihad" geared towards "eliminating and destroying the Western civilization from within…"
There's more linking NAIT to extremists, including payments to Hamas official Mousa Abu Marzook and his family during the 1990s. Imam Jamal Said also is an unindicted co-conspirator in the HLF case. 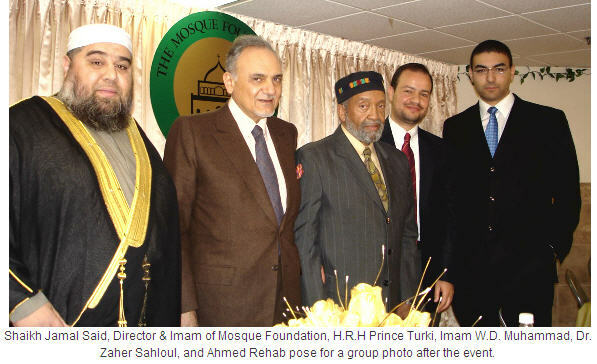 Like NAIT, he is listed among "members of the US Muslim Brotherhood's Palestine Committee and/or its organizations." Evidence in that trial shows the Brotherhood created the Palestine Committee to advance Hamas' agenda in the United States. Said is a Palestinian from the West Bank who acknowledges being inspired by the Muslim Brotherhood. He brought a conservative school of Islamic thought to Chicago's Bridgeview mosque, telling his congregants that America was a land of disbelievers and that non-Islamic holidays like Valentine's Day and Thanksgiving should not be celebrated. Said drove out moderate Muslims from the mosque and divided the community with his political activities that has turned the mosque's focus away from local projects and toward Palestinian causes, according to critics. In December 2003, Said praised Muslim Brotherhood luminary Sayyid Qutb and discouraged women from traveling without chaperones. Presidential candidates don't like distractions and they don't like giving their opponents an easy target. Sometime those targets are old, sometimes they're recent. That explains why Republican John McCain has accepted resignations from at least five advisors due to their roles as lobbyists. Why would anyone expect Obama, who has been fighting pernicious rumors about his own faith, to embrace scrutiny of his newly-appointed outreach director? To some extent, even Rehab seemed to get that, telling O'Reilly that accepting Asbahi's resignation was a smart move for the Obama campaign. But he wouldn't have done it himself. "I think the Obama campaign is out to get votes," Rehab said. "I think it was their judgment that to allow this to continue as a controversy would hurt their chances of getting votes. I think it was a decision made based on that." But Rehab's minor flirtation with rational assessment began and ended with that sentence. Anyone who states on national television that Jamal Said is not radical and is a "great American faith leader" demonstrates either complete dishonesty or ignorance. And considering Rehab's own admission that his fellow Chicagoan Said is someone he knows personally (click here to see a photograph of the two together), it's safe to say he isn't ignorant of the man's disturbing record. But dishonesty isn't anything new for Rehab or the organization he represents, CAIR. And Rehab's defense of Said is just the latest attempt by a CAIR official to define the term "moderate" in a way that strips any meaning from the word. For CAIR, support for Hamas – the stance of CAIR's executive director - is "moderate." Remember that CAIR also is listed as an unindicted co-conspirator in the HLF trial on the same court filing as Said. In several court filings, prosecutors have said CAIR is affiliated with Hamas. CAIR was created in the summer of 1994, less than a year after Hamas members and supporters gathered in Philadelphia to discuss ways to derail the nascent Oslo Peace Accords. Their concerns, captured on audiotape by FBI surveillance teams, were not about the plans details. Rather, they opposed any two-state solution between Palestinians and Israelis - because that would mean an acknowledgment that Israel exists as a legitimate state – and feared the deal could empower the secular Fatah movement and marginalize the Islamist Hamas. CAIR founders Omar Ahmad and Nihad Awad were in the middle of those talks, with Ahmad going into detail about misleading Americans about their political agenda. The Associated Press cited Daud Walid, executive director for the CAIR Michigan chapter, lamenting that the resignation "just shows how Islamophobic the political climate is right now. Baseless smears about a Muslim with a very good reputation was used to marginalize not only him but the community from the political process. ...If someone like Mr. Asbahi can't be vetted to work for the Obama campaign, then who can?" ‘"They use smear tactics to attack Muslims who want to take part in the political process," he said. In a release, CAIR's national office said Asbahi's resignation was "symptomatic of a nationwide effort by Islamophobes who seek to deny Muslims access to the political process." Rehab told the Chicago Tribune that the resignation illustrated "the difficulty of charting the waters of Islamophobia in this election cycle." "I served on that board for only a few weeks before resigning as soon as I became aware of public allegations against another member of the board. Since concerns have been raised about that brief time, I am stepping down...to avoid distracting from Barack Obama's message of change." No one is suggesting that the Obama and McCain campaigns shun Muslim voters. But given the increasing, legitimate questions about the Muslim Brotherhood ties of the self-anointed national organizations, perhaps it is best to get off the beaten path and work on a more micro, individual level. Noreen S. Ahmed-Ullah, Kim Barker, Laurie Cohen, Stephen Franklin and Sam Roe. "Hard-liners won battle for Bridgeview mosque." The Chicago Tribune. February 8, 2004. Tanya: "Here, Bill, you are clearly backing away from confrontation out of fear or intimidation - looking down at your papers trying to gather your thoughts while wrestling over the cognitive dissonance you're obviously experiencing." Figures CAIR would have something to say about it. They seem to have something to say about ANYTHING that doesn't suit Islamist ideals. Go away CAIR!! !